Posted April 10, 2019 by Helen Langley & filed under Honor Balfour, Projects. 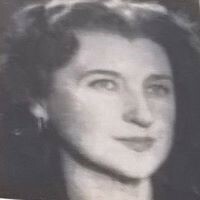 Enlarged detail from a Radio Times photograph of Honor Balfour as a panellist on the new television programme, It’s My Opinion. The programme, recorded early evening on Wednesday 21 May 1957 with an audience in Bridgewater, Somerset, was broadcast at 10.15pm. The other two panellists were the Liberal politician Frank (later Lord) Byers (1915-1984) and the journalist and writer Denzil Batchelor (1906-1969). The discussion was chaired by the historian Alan (later Lord) Bullock (1914-2004). Image reproduced by kind permission of Immediate Media Company Ltd., London. Research into Honor Balfour’s career as a journalist continues to yield rewards. Originally the main focus was to have been on her work as the British staff member in the London office of the American magazine Time, with her freelance work for the BBC, the Guardian, the Observer, etc. as subsidiary areas. Honor’s private papers in Oxford made a good starting point. Hints that her broadcasting career was by far more significant began to emerge from searches of the BBC Genome, and the more extensive coverage in the volumes of the Radio Times, handily available on shelves in the British Library’s Humanities 2 reading room. But it’s in the files in the BBC Written Archives Centre at Caversham that the real discoveries are to be made, and not only those on Honor (relatively few in number but key to the emerging narrative) but also in the files on Stephen Bonarjee (1912- 2003), the producer with whom Honor worked over many years on topical issues radio programmes, and Doreen Stephens (1912-2001) another post war broadcasting pioneer (who under her married name, Gorsky, had been a leading women’s rights campaigner). Reading Bonarjee’s newly-released 1980 oral history interview and his staff file, and those for Topic for Tonight, the programme he created and to which Honor regularly contributed, from 1949 until it was discontinued in 1959, has been revelatory. The research continues but with the emphasis now firmly on Honor Balfour’s role as arguably the first significant woman current affairs commentator in broadcasting. It was against the backdrop of the early rivalry between the Talks and News Departments (which nearly killed off Topic for Tonight at the outset), the pitching of programmes to appeal to audiences including those whose schooling had ended at fourteen, and women, especially housewives, that Honor forged her contribution to broadcasting which would span over the next three decades. Her final broadcast was on 4 May 1979 and as prescient as ever. Posted April 10, 2019 by Helen Langley & filed under Honor Balfour, Lectures, Seminars & Events. The files of the Women’s Publicity Planning Association (WPPA) include material on the Women for Westminster campaign. Initiated in January 1942 by the Association on the suggestion of Dr Edith (later Baroness) Summerskill (1901-1980), W4W encouraged women’s involvement in politics at both national and local level; offering practical guidance as well as information. In 1944 Honor, then still pursuing a political career, was invited in May to speak in support of the Equal Citizenship bill and, in December, to appear on a W4W Brains Trust surveying the three main parties’ programmes. I came across the references in 2016 while researching Irene Ward’s contribution to the Equal Pay Campaign. Briefly marvelling again at the interconnectivity between the lives of people in my various research areas I couldn’t know just how serendipitous the discovery would prove two years later. Posted April 10, 2019 by Helen Langley & filed under Honor Balfour. December 2018, as a guest contributor to the parliamentary archives vote100 blog. Honor regularly wrote and broadcast about Westminster politics. Posted April 10, 2019 by Helen Langley & filed under Cliveden, Ditchley Park, History in the Garden, Lectures, Seminars & Events. Oxfordshire Gardens Trust, 20 September 2019. The talk explores connections between the two great estates in the twentieth century. Nancy Tree- now better known as Nancy Lancaster (1897-1994) was the niece of Lady (Nancy) Astor (1879-1964); Paul Phipps (1880-1953), Nancy Astor’s brother-in-law worked at both properties (the revamped orangery at Ditchley is his) and Norah Lindsay (1873-1948) designed and planted borders at each garden. The schemes of Sir Geoffrey Jellicoe (1900-1996) is another common denominator (though separated by a couple of decades). Researching in the vast Astor archives in the Museum of English Rural Life (MERL)in 2017 suggested that not only should Cliveden’s role in Nancy Astor’s life be re-assessed but also that connections with Ditchley’s reimagining by Ronald and Nancy Tree merited further exploration. Cliveden, Buckinghamshire. One of the two borders leading to the mansion’s imposing entrance; the composition an homage to Norah Lindsay’s original planting. (2017 image). Ditchley Park, Oxfordshire: a request will be made to revisit the garden, last toured with students some while ago, to take a new set of photographs for the September talk. Posted April 10, 2019 by Helen Langley & filed under Cliveden. A talk, at Cliveden, in August 2108 on ‘Lady (Nancy) Astor (1879-1964) and Cliveden’s political landscape’ to members of the volunteer research group preparing for the National Trust marking the centenary of Lady Astor’s election to parliament in 1919. The talk drew on research in 2017 in the Astor archives held in the Museum of English Rural Life (MERL), University of Reading. This had detailed how Nancy Astor consciously-or unconsciously, used invitations to Cliveden to support women active in public life, as well as offering the more usual country house roles such as coping with the rocky marriage of a future Prime Minister -Harold Macmillan (later 1st Earl of Stockton, 1894-1986), and entertaining celebrities. Some of the leading figures from the first intakes of women MPs, and campaigners for women’s rights, were guests at Cliveden including Margaret Wintringham (1879-1955), the first woman Liberal MP; the Labour MP Ellen Wilkinson (1891-1947), Irene (later Baroness) Ward (1895-1980), and Mavis Tate (1893-1947). In 1935 Tate had been instrumental with other women MPs in securing the release from detention in Germany of the wife and child of Herr Seger, the first SDP member of the Reichstag to be arrested in 1933. A less fortunate guest was Frau Dr Luders, an economist and women’s rights activist who briefly appears in the Astor archive, her fate uncertain in war-time Germany (despite Nancy Astor’s intervention). In another of those fortunate discoveries, in February I came across a 1951 document in the BBC Written Archives which revealed that despite terrible suffering she had survived and at seventy five was an inspirational figure at post war international conferences. Posted July 6, 2018 by Helen Langley & filed under Honor Balfour, Projects. I always believed Honor Balfour (1912-2001) was too modest about her life but even so I’ve been blown away by discovering the extent and range of her broadcasting career. I shouldn’t have been surprised, she had already pushed at the boundaries in print journalism by convincing Stefan Lorant to appoint her to the founding editorial team of Picture Post in 1938. During the war she was recruited by Walter Graebner for Time-Life magazine, diverting her from a career in Whitehall. In the 1990s we discussed some of her innovatory radio programmes. But even so to see the frequency with which her name was listed in the schedules of the Radio Times for over thirty years from 1946 was a revelation. Here was a woman talking about current affairs, commenting on social issues and, perhaps, most surprising of all, in the team analysing the 1955 General Election result. All this at a time when women’s voices were still largely restricted to home-making and entertainment programmes. Interestingly, it was in the new medium of television where this appears to have been a constraint. In the mid-1950s Honor had a regular fifteen minute slot in which she addressed topical issues. It was broadcast at 3.35 pm, after Mainly for Women. But even if her appearances on television were usually limited to afternoons, it was still no mean feat for a woman political journalist to have significant footholds in both print and broadcast media (although Honor would not thank me for mentioning her gender). The research is for an article commissioned by the editor of the Journal of Liberal Democrat History; a companion piece to ‘Honor Balfour and the Liberal Party: an archival perspective’ which appeared in the Spring 2013 issue (see also my Publications page). The digitised online overview of Radio Times schedules was a boon but for detail the volumes of the actual magazine available on the shelves in the British Library Humanities Reading Room were invaluable preparation for consulting the Honor Balfour archive in the Bodleian Library. Next stop: the BBC Written Archives resource in Caversham and the British Film Institute (for archival recordings). These will be followed up in the late autumn with a work-in-progress paper in London. Posted November 15, 2017 by Helen Langley & filed under Equal pay for women, Projects. ‘A home should be the centre of a woman’s life, not its boundary’ (Irene Ward). Inspired by the research for my paper, Irene Ward, ‘Baroness Ward of North Tyneside (1895-1980) Unorthodox political warrior’ to the Institute of Contemporary British History seminar on 4 October 2015, the intention was to spend most of 2016 exploring further the campaign for equal pay for women, extending the focus beyond Irene Ward, looking more closely at the war-time and early post-war developments culminating in the 1954 act. Pamphlet published in 1952 by the Equal Pay Campaign Committee. Pierotti papers, the Women’s Library, London School of Economics (LSE), 7 AMP/F/10/09.Miss A Muriel Pierotti was vice-chair of the committee. She also served as secretary of the National Union of Women Teachers. Image reproduced courtesy of the Women’s Library, LSE, University of London. The first few months of 2016 were spent consulting material in the Women’s Library at LSE. The archive of the Women’s Publicity Planning Association (WPPA) proved particularly fruitful. War time files on the drive to secure ‘Equal compensation for equal danger’ for injured women civilians; nationwide meetings to encourage involvement in politics at local and national levels – the ‘Women for Westminster’ programme; or win greater representation on committees planning post-war reconstruction not only brilliantly illuminated my earlier research, but foregrounded the work of Mavis Tate, MP and Dr Edith Summerskill, MP (and included mention of Honor Balfour), all of whom, had I but known it at the time, would later re-appear in my research into the Astors and twentieth century Cliveden. Posted November 15, 2017 by Helen Langley & filed under Cliveden, Projects. Inspired by the depth and breadth of the Astors’ archive at the Museum of English Rural Life (MERL), University of Reading, my current project focuses on Waldorf and Nancy Astor’s years at Cliveden and some of the less familiar stories. From the estate papers, for example, we learn of the contribution of Captain Harry Lindsay (the estranged husband of the garden designer Norah Lindsay) to the refurbishment and repair of the mansion in 1906-1907. The cost-cutting moves which led to Cliveden’s temporary closure in 1931. Most interesting of all however, as we move towards commemorating the centenary of women gaining the vote in 1918, and Nancy Astor’s ground breaking election in 1919, is how Cliveden fits into the narrative of the advance of women in British public life in the following three decades. A talk on this topic has been pencilled in for next year. The iron gates into the former walled garden commemorated Nancy Astor’s eightieth birthday in 1959. As visitors pass through the entrance the gate with her initials is to the right, the gate with the date to the left. Posted November 15, 2017 by Helen Langley & filed under Cliveden, History in the Garden, Projects. February 2016 brought an invitation to return to an old favourite topic: houses and gardens with modern political associations. Discussions with a potential publisher updated the list of properties to be considered. Hughenden, Cliveden, The Wharf, Garsington, Trent Park and Port Lympne; Chartwell, Wallington, Sissinghurst, Birch Grove House, The Manor House, Hell Corner Farm, and Thenford were added to three properties from past lectures: The Wharf, Buscot and Ditchley. Researching the Astors at Cliveden for a sample chapter brought a reconnection with the work of campaigners for equal compensation and pay. By the late 1930s Nancy Astor’s parliamentary reputation was in decline but some of her war time interventions were beneficial to the lobbying for women’s equality. She was also vocal in her support for women to be more involved in plans for post-war reconstruction. 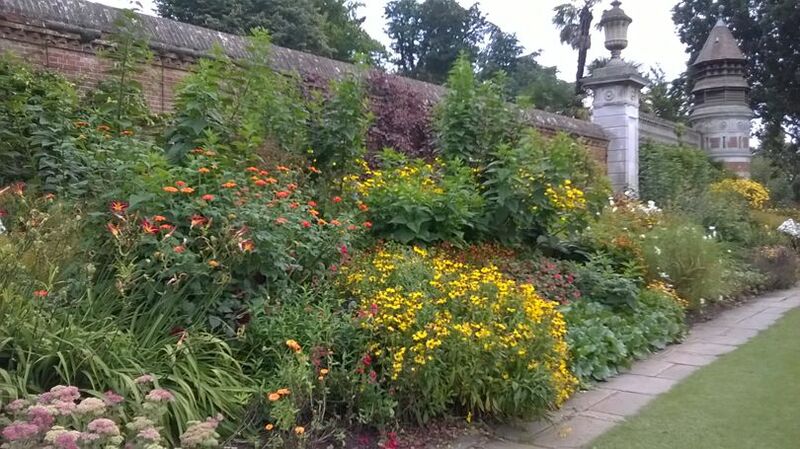 Cliveden forecourt border, August 2017.The planting is inspired by Norah Lindsay’s schemes for Nancy Astor in the 1920s and early 1930s. Few overt reminders of Nancy Astor survive in the gardens; the pair of gates into a former walled garden (the present location of the information centre) commemorating her eightieth birthday in 1959 a rare exception. Cliveden was Nancy’s stage too. The papers of Waldorf and Nancy Astor in the excellent Museum of English Rural Life archive (MERL), University of Reading, reveal that during the war, campaigning women MPs as politically various as Mavis Tate (appointed chair of the Women’s Power Committee in 1941, and of the Equal Pay Campaign in 1942); Irene Ward (Chair, Committee on Woman Power, 1940) and Ellen Wilkinson were guests on separate occasions. Margaret Wintringham, Liberal politician and the second woman to take her seat in Parliament was a frequent guest long after she had lost her seat in the 1924 General Election. Nancy Astor’s steadfastness in the hostile, all-male parliament, emboldened Wintringham to stick it out at Westminster (as she gratefully acknowledged) but the key to their long-lasting friendship may have stemmed from shared Christian Science beliefs. The social and political mix of guests at Cliveden weekends was usually eclectic; an invitation brought opportunities to relax and recharge, but also network. Invitations extended beyond establishment figures to weary social workers and civil servants. As MP for the heavily-bombed constituency of Plymouth Sutton (and regularly deputizing for her husband as Lord Mayor) much of Nancy Astor’s attention during the war years was, of necessity, focused on Plymouth. The constant travelling between the two cities, not to mention nationwide speaking engagements, was exhausting. Little time was left for reflection – a quality already largely missing from Nancy Astor’s personality. The Astor archives at MERL far exceeded my expectations as a resource. The estate papers are particularly good and form the basis of my reassessment of the roles played by Cliveden in the era of Nancy and Waldorf Astor. Honor Balfour fleetingly appears in both the LSE’s WPPA archive and MERL’s Astor papers, as a participant in the Brains Trust event organized by Women for Westminster in December 1944, and a guest at Cliveden in November 1949. The latter presumably as an upcoming commentator on Anglo-American relations, and freelancer on the David Astor-edited Observer newspaper. Seeing her name in the Visitor’s Book reminded me of our many conversations at her home in Windrush, and led me to regret we never discussed her impressions of Cliveden. An astute commentator on contemporary politics right to the end of her life her insights are much missed. Posted October 25, 2017 by Helen Langley & filed under History in the Garden, Projects. "A big, cream and white wooden structure shaped like a giant flower pedestal but with a human-size door was utterly intriguing." The Historic Gardens Review published by the Historic Gardens Foundation is available by subscription from the Foundation. Copies are also accessible in the Royal Horticultural Society’s Lindley Library, London. A decorative arts study tour to Helsinki in May 2016, brought an unexpected opportunity to visit Helsinki’s Botanic garden. A major refurbishment was evidently underway but there was still much to admire, not least in the range of glasshouses chronicling the evolution of plant life. The prospect of orange trees naturally drew me in but the real delight, and for several months a puzzle, lay outside. A big, cream and white wooden structure shaped like a giant flower pedestal but with a human-size door was utterly intriguing. Unfortunately the photograph of the mysterious pedestal was too blurry to be included in the article subsequently commissioned by the editor of Historic Gardens Foundation’s magazine. But it was through the HGF‘s encouragement to contact an expert on Finnish gardens, the Swiss scholar, Dr Eeva Ruoff, that the mystery was eventually solved. Dr Ruoff immediately identified the wooden structure as one of Helsinki’s few surviving original well huts. Once a common feature on the streets of Helsinki and elsewhere, pavement laying and road extensions decimated their numbers. That in the Helsinki Botanic Garden survives because it was relocated and re-purposed as a garden feature. The delightful well-hut is located in Rauma, on the west coast of Finland. Image courtesy of Dr Eeva Ruoff. Others, like this one at Rauma, on Finland’s west coast and north of the old capital, Turku, survive in situ. Rausa’s old town with its wooden houses is a UNESCO World Heritage Site.